UNITY — The town’s Economic Development Committee struggled over how to move forward to create a marketing plan at a tense meeting Monday night, after a proposal to hire an outside marketing strategist was denied by the select board in June. Two of three members of the Board of Selectmen denied a request to spend $5,000 on a marketing professional to develop a plan for the town, arguing that it’s not the right time or the right price. After a heated discussion, the committee decided to work on initiatives themselves on a volunteer basis, although most members felt frustrated by the lack of investment. The Economic Development Committee handles the town’s tax increment financing, or TIF, money, which would fund the marketing project. Unity gets about $60,000 to $70,000 annually from TIF revenue, which must be spent on economic development, and has about eight years left in its agreement with the state. A sub-committee assigned to marketing put out a request for qualifications and received five bids, which it narrowed down for the select board. However, Selectmen Penny Sampson and Tony Avila both denied the request to release the funds, which are already appropriated for marketing purposes. “There are a lot of easy opportunities for marketing — free, low hanging fruit so to speak,” Sampson said. There are a number of Maine tourism websites advertising lakes, trails and fairs that don’t list any of Unity’s attractions, for example, she said. Selectman Emily Newell, who was unable to make the meeting, said in a prior interview that she was frustrated by the vote. “This seems extremely short-sighted by the select board, to think this way,” said Jim Buckle, a committee member. Jennifer deHart, a member of the sub-committee who pitched the idea, said all of these arguments were made at the previous selectmen’s meeting. Multiple committee members asked the selectmen to reconsider their votes. Sampson said she didn’t object to spending the money, but that it shouldn’t happen now. The committee can’t reach a consensus and the town doesn’t have an updated comprehensive plan, she said. The marketing sub-committee proposed forming a volunteer group to create a marketing plan, though deHart said it would take much longer to accomplish. One of the sub-committee members, Alicyn Smart, asked how badly the select board wanted the project done because of the amount of time it would take. Mary Leaming, the chair of the economic development committee, said the group has accomplished a lot, especially considering it is a large group of people that only meets once per month. Committee member Larry King questioned whether hiring a professional would improve consensus among the group. Leaming denied that accusation, saying that volunteers are allowed to stop their work if they feel like they’re not on the same page as the town, so this conversation was important. At the end of the discussion, the group split between a marketing strategy sub-committee and a sub-committee to work on the small things the town would like to see, like signage around town and website listings. 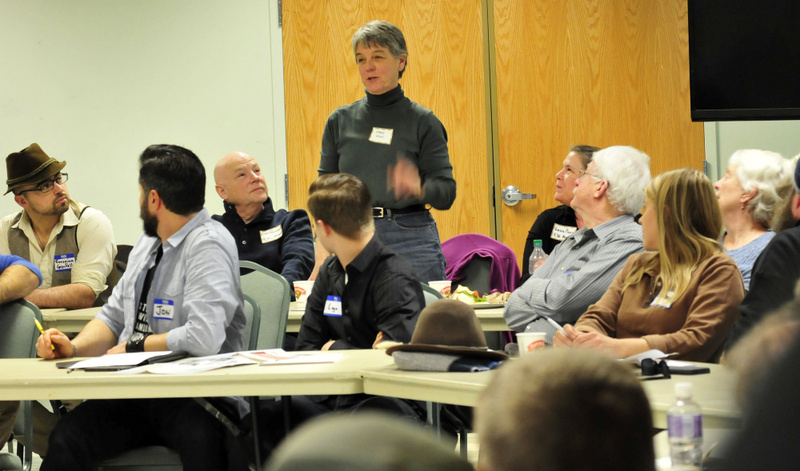 With funding from the Unity Foundation, the committee hired GrowSmart Maine, a nonprofit that facilitates discussions within communities and helps connect them with experts across the country to get projects done. GrowSmart held two town-wide meetings to help the committee and other residents talk through ideas of what they would like to see happen in the small town of about 2,000 people. Five potential projects came out of the meetings: a small hotel and restaurant, a brew pub, a space for artisans, a comprehensive marketing strategy, and a center for the town’s trails and lake, along with upgrades.